Danganronpa has had a hell of a journey over the past few years, telling stories in the form of visual novels, anime, and even a third-person shooter. The latest entry in the series, Danganronpa V3: Killing Harmony, feels like a fresh beginning of sorts. This piece originally appeared 9/22/17. If you aren’t familiar with the wild world of Danganronpa, here’s the premise: Sixteen high school students wake up with amnesia, and are told by a talking robot bear that they are trapped in a school (or, in one case, a tropical island) and cannot leave. The only way out is for a student to “graduate” by killing a fellow classmate and getting away with it. As you play through each chapter, which mostly involves reading the story and building up Persona-esque bonds with your classmates, you’ll eventually see people die. Then, it’ll be up to your main character to discern what happened. After investigating each crime scene, you’ll participate in a class trial, presenting and refuting evidence, changing hearts and minds, uncovering twists and turns along the way. Danganronpa V3 tries to be more grounded than previous entries in the series. The killing game designs in this one aren’t as outlandish as, say, the strawberry house mystery of Danganronpa 2, as many of the whodunnits have outcomes that could reasonably happen in real life. The first case is an all-time highlight, but after that, the pacing starts to falter. Some of the capers are too easy to piece together, and the middle run of murders don’t feel quite as difficult as previous Danganronpa mysteries. In Danganronpa V3, like in the first two games, each class trial consists of mini-games that challenge both your head and your fingers. The main mini-game is a discussion between classmates, punctuated by Non-Stop Debates. Words from each character’s argument float around the screen, changing direction and speed, and you have to identify the key phrase and shoot it with the right Truth Bullet (physical manifestations of facts and evidence about the murder) to break their argument, refuting or agreeing with them to move on to the next topic. It gets heated, and some debates devolve into mass panic, as several voices and discussions light up around the trial room. This time, there’s a twist to debates. In addition to telling the truth or agreeing, you can commit perjury by lying. Instead of using evidence or logic to solve something, you can lie about it, to get the discussion to move on to a different topic. It’s a really neat feature that opens up separate routes through the debates, while posing an interesting ethical dilemma—if lying is the only way towards the ultimate truth, does that make it OK? Lying is almost always optional, and if you choose to perjure yourself over telling the truth, your game may progress differently. In talking with others who have played the trials, our paths have diverged depending on when and how we’ve lied within each debate, and I’m actually excited to go back and see where and how the paths could have branched out. The end result is always the same, but it makes the journey a little more interesting knowing there isn’t just one set road. The newer mini-games crafted to represent moments of inspiration in the class trials are good additions. Deduction games like Psyche Taxi, where you drive a car through letters to form questions and then pick up bystanders with the correct answers, are fun, but my favorite by far was Debate Scrum. Pitting two opposing sides against each other on an issue, you have to launch rocket-keywords at the opponents to push back, eventually winning them over to your side. It’s mechanically simple, but plays like a natural extension of the debates, and the music and build-up to each scrum is fantastic. Developer Spike Chunsoft at this point has mastered the right time to fade in the right music, and certain songs like “Discussion -HEAT UP-” and “New World Order” enhance the game’s best moments. The cast of characters for this killing game is surprisingly strong, and helps to alleviate many of the pacing issues that plague the middle of the game. In Danganronpa tradition, each of the 16 main characters is an ultimate student, proficient in a specific field of study. Kaede, the ultimate pianist, is fairly straightforward, as is Shuichi, the ultimate detective. Some students are identifiable more by their personality than their talent—the ultimate artist is also a religious fanatic, and the ultimate tennis pro’s story centers more around his life as a convict, after he eliminated a gang with his tennis skills. Kokichi Oma, the ultimate evil leader, is a standout in particular, as he ends up playing a foil to your character in trials, and you never quite know whether his lies are meant to obfuscate the facts or force your class to dismantle them, working towards the greater truth. Though you only get limited time with the cast during the game’s story, due to limited free time segments, there is still the post-game relationship building section, as well as a number of mini-games and one complex, convoluted board game that mostly exists to show different classes of Danganronpa characters interacting. It’s funny to play through and a completely optional bit of side content, but the mechanics end up getting in the way of the jokes and interactions, feeling more like a chore with sparse rewards than a way to play “what-if” with the massive cast of Danganronpa. It also helps to flesh out a cast who, due to various story reasons, disappear from the cast before you really have time to get to know them. Murder and mystery are the crux of daily life in Danganronpa, but the game’s humor tries to add comic relief to the otherwise grim setting, and for the most part, the laughs stick. There are a surprising number of relevant pop culture and current event references, from Full Metal Alchemist and Fate/stay night jokes to one mention of a leader who prefers “alternative facts.” Sometimes it goes just a little farther over the line than necessary—especially when characters throw long strings of four-letter vulgarities at each other—but it’s in keeping with the darker tone of the series. These elements all build into a formula, a repetition that defines your time in Danganronpa V3 as it has in previous games. Daily life starts, and you wander the school. Open some new doors. Discover new labs, rooms, treasures. One has poison in it. Another has an odd window that looks out of place. You make mental notes. The days progress, and as you spend time with classmates, events escalate. Tensions rise, and soon, someone is dead. Daily life turns to deadly life, and you’re investigating crime scenes, looking for clues, marking them down as truth bullets for the inevitable trial. And when it comes time for trial, you gather your thoughts and go in, maybe with a small inkling of what the truth is, but always emerging from the other side the same way: Downtrodden, and a group with one less among its ranks. The cycle stays unbroken until the final chapter of the game, and thanks to some of the tedium of the middle few chapters, the repetition can wear on you. Those cases feel procedural at times, like a daytime detective show. There’s a beginning, middle, and end, but the implications aren’t massive and the outcomes, at least in some cases, are predictable. The motives are barely there. You see the culprit coming from a mile away, or you get to a solution a few steps ahead of the script’s pacing, and now you’re trying to get the debate to catch up to where your train of thought got to minutes prior. It’s a problem with most mystery-solving games, like Phoenix Wright or Sherlock Holmes, so it might just be symptomatic of the genre, but at least for the most part, I felt like I was keeping pace with the story’s unraveling threads. Danganronpa V3 has some of my favorite mysteries of the series yet, and some of the least memorable as well. After the first chapter, it takes several before the game really kicks back into gear with the main plot. The whole is greater than the sum of its parts, and by the end I felt satisfied with the game, but I couldn’t help looking back on some of its scene-to-scene with, at best, ambivalence. But for the nitpicking that can be done of how it gets to its ending, Danganronpa V3 still satisfies that need I have for more of this specific kind of game. It’s enjoyable running around the campus, dropping coins into bubble machines to get prizes to give to my in-game classmates, building bonds with them while learning more about the world. And yet, when the tension starts building, when things start seeming wrong and then the cutscene kicks in, with the series’ signature pink blood seeping in from the edges, I perk up in my seat. There’s another murder, another culprit, another mystery to solve. Where Danganronpa V3 shines is in those moments where, countless murders later, I’m still excited to solve the whodunnit. 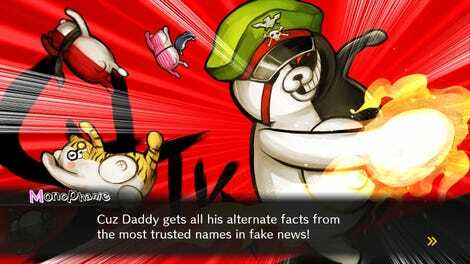 When class trials get heated up and I’m staring at a screen, trying to piece together in my head how or why something could have happened, what could possibly disprove an airtight alibi, what deus ex machina allowed for this series of events to unfold, it feels like the Danganronpa I know and love. Danganronpa V3 still gives me those moments, if only a little less frequently than I would have liked.